Home / Articles by Njkinny / Health and Lifestyle / Shopping / My adventures as the wedding planner for Katrina~ #Baggout to the rescue! My adventures as the wedding planner for Katrina~ #Baggout to the rescue! 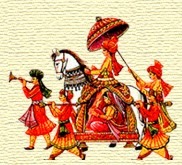 Indian weddings are colorful, often frivolous events but still events that happen once in a lifetime! Every girl dreams of having a memorable wedding with her special someone with all her friends and family present along with happiness and cheer, beautiful settings and wearing the most breathtaking dresses! 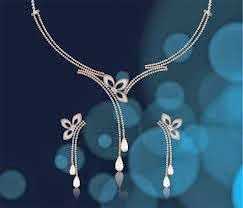 She wants to look the best and feel the best on her special day. 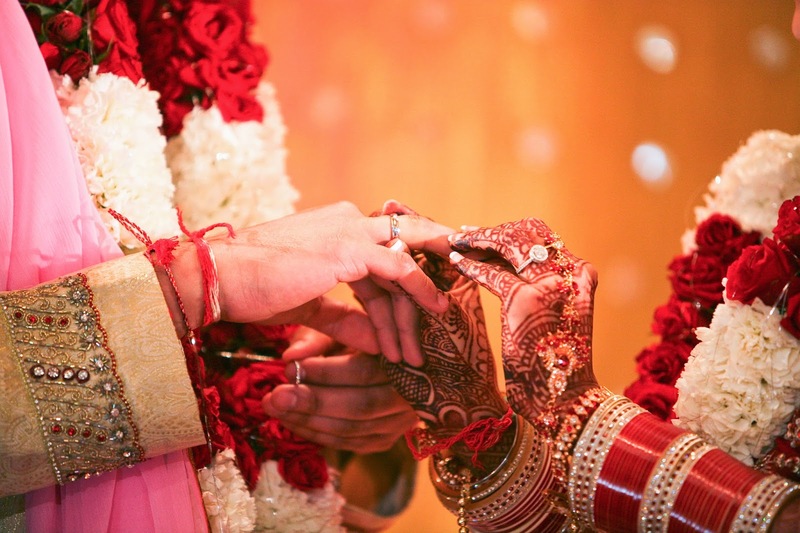 I have always been attracted to weddings and took a keen interest in the planning and organizing of the festivities. So it was natural that when I grew up, I took up the wedding planning business and became a wedding planner! With quite a few successfully planned weddings to my name, I was overjoyed when Katrina contacted me to organize her wedding to Ranbir Kapoor! These two are among the most dashing couple and so it was a big responsibility and quite a challenge to plan a wedding that suited them and made their special day memorable! I would have really freaked out if Baggout had not come to my rescue. There was so much to do but most of my work was saved because of Baggout. Baggout.com is the new revolutionary online portal that brings all the top brands and various products and services at one place. With Baggout at my side, I could comfortably sit indoors and yet get the best items and services! My first priority was to book the hotels for the stay of Katrina and her family. They were arriving early to help finalize the wedding venue, caterers and other stuff. 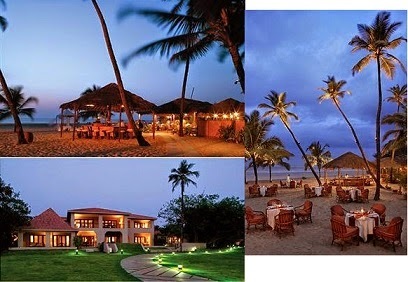 The exotic beach state of Goa had been decided as the wedding location and so I took Baggout's help to get the best deals and booked Grand Hyatt Goa via makemytrip.com for the family's stay. I even got a great offer on the booking on makemytrip.com since I had gone through Baggout. Exciting, isnt it! Katrina was very happy that I had got them bookings in Grand Hyatt Goa. "Grand Hyatt Goa is so beautiful! I loved my stay the last time. Thanks. I love your style." She told me. "How did you get such a great discount?" she asked. "Oh! I got the deal because of Baggout. 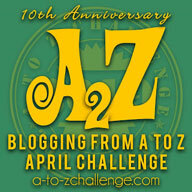 It's a great website which has a variety of products and brings all leading brands under one roof." "That's cool. I'll have to check it out." Katrina said. I was so happy that my first task had gone down so well with my client. After the booking of the hotel, I even booked their open lawn for the small party that Katrina wanted to throw for her close friends on the engagement day. 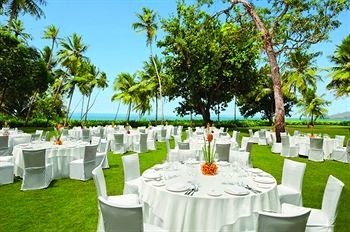 The outdoor venue of the Grand Hyatt Goa was decided for this. If you think you know all your guests then think again. Once we sat down to prepare the guest list, even Kat was surprised by the end number. "Oh God! I never knew I had so many relatives." she joked. 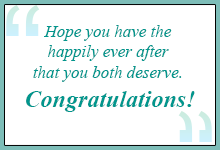 The invitations had to be sent out at the earliest as many of her relatives were far away so I had the challenge of finding the best card designer and printer and also save some money. I didnt want to go over the top just because Kat was an actress with multimillion earnings! 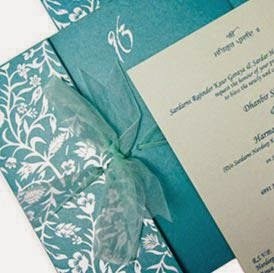 After browsing and checking out quite a few options on Baggout, I selected printvenue and gave them the order of the printing of the invitations. I got some great offers on this website, all thanks to Baggout. Now that the venue was decided, flower and cake supplier booked, the invitations sent for printing and I also had the caterer booked, I was nervous about dressing Katrina in dresses that would make her outshine everyone else at her wedding! After checking out a number of websites through Baggout, I finally landed on Myntra. I got a great deal of over 60% off on ethnic wear on Myntra, thanks to Baggout and was impressed by the elaborate collection of ethnic clothes on the website. 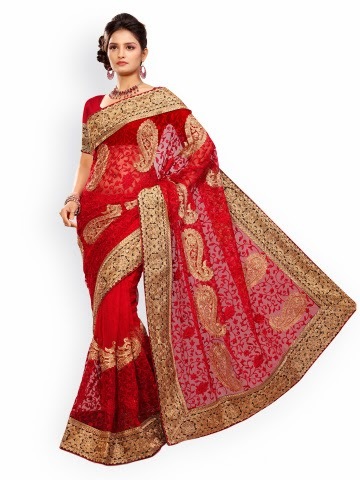 I selected the below sarees for Katrina. I knew she looked great in a saree. Next, Kat wanted diamond jewellery matching her dresses and for this we stopped at Surat Diamond Jewellery (suratdiamond.com) website from Baggout. After procuring some discount coupons from Baggout, we sat down to selecting and buying jewellery. Kat selected some really pretty pieces and was satisfied with her purchase. Now that the basic arrangements were done, I gave the other arrangement responsibilities like booking a photographer, a mehendi artist etc. to my team and went headlong in the service of the bride. "Marriages are made in heaven, but are celebrated on earth..."
Kat and Ranbir's wedding was a joyous event with lots of fun, some happy tears and broad smiles all around. I cant say I was always sure that I would plan a dream wedding for such a big star but when I saw Kat happy and beaming on her special day, all my days of hard work looked like they had payed off! Baggout was my silent partner in my adventures as the wedding planner and I am so happy to finally give a happy memorable to Kat and Ranbir. I know they are the new fans of Baggout along side me. After all, who else can claim to bring all the top brands from various fields like travel, fashion, food, books and kids etc. under one roof and also give the customer such great discount deals? Baggout is the new destination for everything from beauty, holiday, fashion, food, travel, electronics, books etc. and it is here to stay. 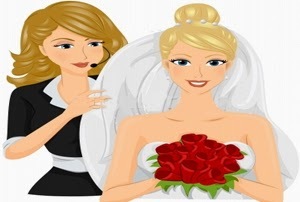 The above post is a fictional account written as part of the Blog and Win contest going on Baggout in which we are to write a hypothetical account of the wedding of our favorite celebrity where we are the wedding planner! All the images are either taken from Google, Baggout or from the retailer websites.